NORTH WILDWOOD – In a ceremony held in front of the entire student body Monday morning, Wildwood Catholic High School senior softball star Emily Cimino put ink to paper to finally make her college choice official. 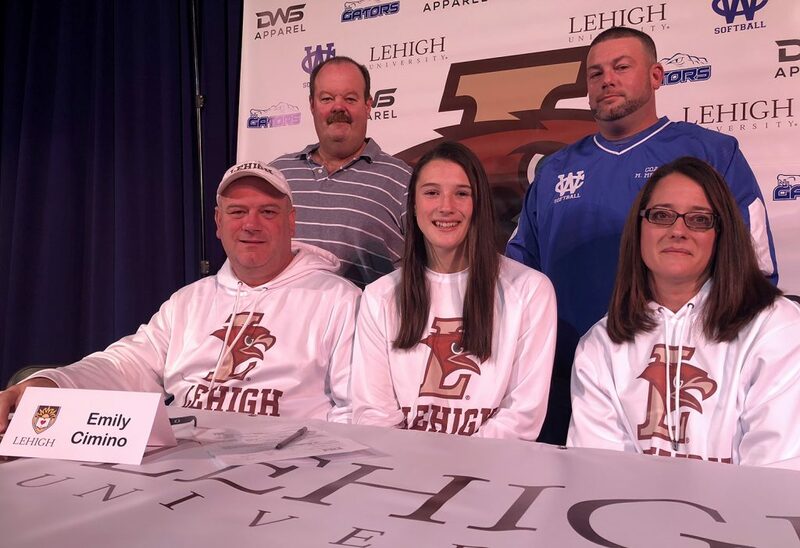 Cimino, holder of numerous program records both as a hitter and pitcher, signed a National Letter of Intent to attend Lehigh University on a partial scholarship to play softball. She had verbally committed to the Patriot League school about a year ago. In addition to her teammates and classmates, Cimino was joined at the ceremony by her parents, Todd and Lynn; other family members; Wildwood Catholic softball coaches; and school teachers and administrators. Known largely for her pitching exploits for the Crusaders, Cimino was recruited by Lehigh more through her offensive production and is projected to play first base at the college level. The left-handed hitting Cimino batted a whopping .676 last season as a junior, posting 13 doubles, 13 home runs, 45 RBI and 40 runs scored. She is already Wildwood Catholic softball’s all-time leader in hits with 129 and will bring a .581 career batting average into her senior season in the spring. As a pitcher, she went 10-3 with 97 strikeouts in 87 innings pitched last season. She did not pitch in any games for about three weeks in the middle of the season due to a hip injury but returned in time for the state playoffs. She’s 30-15 with 320 strikeouts in 295 innings for her high school career. Cimino, who plays club travel softball for the New Jersey Gators, has helped lead Wildwood Catholic to South Jersey and Cape-Atlantic National Conference championships in 2017 and 2018. Cimino, who plans to major in biology at Lehigh, is also an outstanding student who carries a 4.5 grade point average at Wildwood Catholic. Wildwood Catholic senior softball standout Emily Cimino signed a National Letter of Intent to play softball at Division I Lehigh University. She’s pictured with (from left): seated – her parents, Todd and Lynn; standing – WCHS assistant softball coach Bill Kita, WCHS head softball coach Matt Megines.